Smartwatches may be all the rage at the moment, but fitness bands are still selling very well td will continue to do so in the coming years. Currently Fitbit and Garmin are probably the most well known names in this market. Ok, there is Xiaomi, too, but its devices are of the budget kind and sell mostly in Asia. 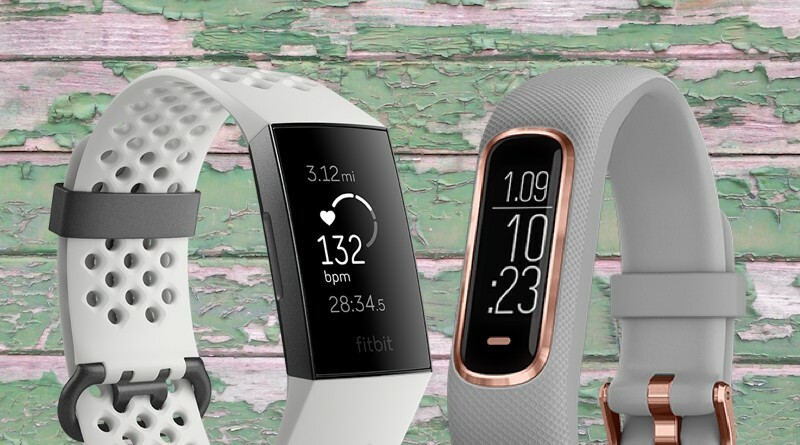 Both Fitbit and Garmin have a wide range of wearables on offer. Ahead of IFA 2018 in Berlin, the San Francisco manufacturer came out with Charge 3, an updated version of its best selling tracker. Not to be left behind, Garmin followed this up a few days later with Vivosmart 4. The two wearables are some of the most feature-packed fitness bands around and will do the trick if you’re looking for something to keep tabs on your activity 24/7. But there are some differences you should be aware of. Read on to find out how they compare. Fitbit Charge 3 don’t look all too dissimilar from its predecessor. But it does look more stylish and sporty. The device is built of more lightweight material than Charge 2 including an aerospace grade aluminum case and Corning Gorilla Glass 3 display. Measuring 18.3mm in width, 11.8 mm in depth and weighting only 29 grams, you’ll hardly feel it on your wrist. The single physical button on the right hand side has been swapped with an inductive button. The display has grown by about 40% from the previous version, so is much better suited for quickly glancing down at your stats. The Vivosmart 4 also features a fairly sporty, rubberized look. It comes with a silicone strap, aluminum bezel and polycarbonate lens. Both of these devices are definitely designed with fitness rather than fashion freaks in mind. Garmin seems to be dead set on its mission to minimize everything! Vivosmart 4 is slimmer in design and more lightweight than Charge 3. In fact, the gizmo measures just 15mm in width, 10.5mm in depth and weighs like a feather – only 20 grams. While Charge 3 comes with two bands in the box that you can swap depending on your wrist size, you’ll need to measure your wrist and decide on a small/medium or large when you purchase the Vivosmart. The other good thing about Charge 3 is that you can swap bands for different colors when you get tired of the look. That’s not the case with the Vivosmart. Apart from the physical dimensions, another difference between Charge 3 and Vivosmart 4 is in the display. The first features a grayscale OLED touchscreen that comes with 100 x 150 pixel resolution. Vivosmart on the other hand, sports a grayscale OLED screen and comes with 48 x 128 pixel resolution. The display is off on both devices by default, and springs to action when you raise your wrist, tap on the screen or a notification comes through. Due to its bigger size, reading stats and messages on the Charge 3 is definitely much easier. Under the hood there is little to separate the two. They both come with a 3 axis-accelerometer, barometric altimeter, heart rate monitor, vibration alert and pulse oximeter. Neither comes with a built-in GPS sensor but Charge 3 can tap into your smartphone to pick up on satellite readings. Vivosmart’s party trick is that it has ANT+ compatibility, but only for sending HR data. This means that it can connect to external heart rate monitors, like chest heart rate straps. You won’t be able to do this with the Fitbit. The other advantage of Vivosmart 4 is that it will dish out pulse oximetry values on demand during the day and automatically when you’re asleep. We have yet to see the SpO2 sensor put to real-world use on any Fitbit device. Hopefully, software updates will enable this soon. But at the moment, the sensor is just sitting there taking up space. Battery life is important and is always a compromise between size, screen resolution and more. Luckily processing power is increasing each year as is battery technology. The good news is that both of these devices provide a respectable 7 days of juice on a single charge. The are also water-friendly. Charge 3 and Vivosmart 4 come with a fantastic 5 ATM water-resistance rating, which means you can dunk them down to depths of 50 metres. They’ll track your adventures in the pool, too, and spit out relevant stats. As you’d expect, you’ll find the essentials on both devices. This includes 24/7 heart rate monitoring (including current, resting and heart rate zone information), tracking of steps, distance travelled, floors climbed, active minutes, calories burned and advanced sleep tracking features. There is also automatic activity recognition, move reminders and some more advanced performance metrics such as VO2 Max. Garmin and Fitbit have had this side of things nailed down for quite some time. Both companies also offer a comprehensive software platform that includes a smartphone app and web dashboard. The Fitbit app is probably easier to use but Garmin Connect is more comprehensive. We would start off with the most obvious one – the screen size. While Vivosmart’s ultra-slim form factor might appeal to some, it actually makes reading anything on the display quite difficult. While this may not be a problem in the comfort of your home its a different story if, for example, you’re in the middle of a run. The larger screen-real estate on Charge 3 makes keeping an eye on stats much easier. The other important difference is the ability to connect to GPS on Fitbit’s device. This allows for more accurate stats and mapping of your activity. If you run or cycle on a regular basis, then it can be very valuable. We are not sure why Garmin left this functionality out. There is of course ANT+ connectivity on the Vivosmart for sending HR data. And lets not forget the above mentioned blood oxygen sensor. You can use it on Vivosmart now, but the functionality has yet to be enabled on Charge 3. Garmin’s device will gauge your oxygen saturation levels at night, allowing you to better understand your sleep quality. This can potentially be used to identify sleep conditions such as apnea. You can also check your oxygen levels during the day at the press of a button. Vivosmart also comes with 24/7 stress monitoring and something the company calls Body Battery energy monitoring. This uses a combination of stress, heart rate variability (HRV), sleep and activity data to let you know when to push hard, when to rest. The info should enable you to make better, more informed decisions on how and when to train. The other differences are not that important but we’ll mention them for completeness sake. This includes the rep counting function on the Vívoactive, and the Female Health Tracking function on the Fitbit. On to the non-fitness functions. Even though these are fitness bands, they come with some functions you’ll find on smartwatches. Both show basic notifications to keep you connected on the go. You will need to use your phone, though, to read the messages in full. By default, the bands shows the time so you can also use them as a watch. In addition to this Charge 3 has the ability to reply to messages (for Android users) and the option to accept or reject calls. It also comes in a more expensive Special Edition version that has an NFC chip for contactless payments. Fitbit Charge 3 and Garmin Vivosmart 4 are two very similar animals. If you’re looking for something to keep tabs on your fitness 24/7 both will fit the bill. There are a few differences to be aware of, though. Charge 3 is bulkier and more well suited for quickly glancing at your stats. The Vivosmart comes in an ultra-slim form-factor which may appeal to some, particularly the female demographic. But it does come at a price in that the screen is very narrow which makes it difficult to read. Both devices sport pretty much the same specs under the hood but Charge 3 has the ability to connect to your smartphone’s GPS, something runners will appreciate. Vivosmart doesn’t have this functionality but comes with ANT+ so can broadcast HR data. You’ll also get some extra stats on Garmin’s device including 24/7 stress monitoring, Body Battery energy monitoring, oxygen level reading and counting reps and sets in the gym. Fitbit’s device comes with the Female Health Tracking function. All things considered, our personal preference is the Fitbit Charge 3. It lacks some of the functionality you’ll find on the Garmin device but the larger screen makes all the difference. This is down to individual taste, though, and some may prefer the ultra-slim form-factor. Garmin’s tracker also sells for about $20 less. Fitbit Flex 2 or Alta HR: which is right for you? Fitbit Charge 3 vs Alta HR: Which is right for you? Charge 3 is a clear winner – to omit GPS is a ridiculous decision on a fitness tracker. I have the Charge 3 on preorder, but I’ve since found out that it isn’t compatible with my Pixel 2 XL. I’m still going to try it, but the Vivosmart 4 looks like a great alternative. Disappointed that the Sp02 sensor isn’t used. I truly hope that the software update coming “by end of year” will work similarly to Garmin’s. There’s a big PLUS for the Garmin, at this point. I’m a larger sized guy. I’d say the size is appropriate on my arm: Not too big, not too small. It’s VERY light to the point that it’s easy to forget you have it on. I purchased the all black one. Vivosmart 4 is not ant + comparable. It can only send heart rate not receive from a chest strap. Unfortunately this cripples it’s use for anything above 120 HR. It is ant+ compatible but as you quite rightly say – only for sending data, not reading. You may have tried already but perhaps tightening the strap might help with high-intensity readings.